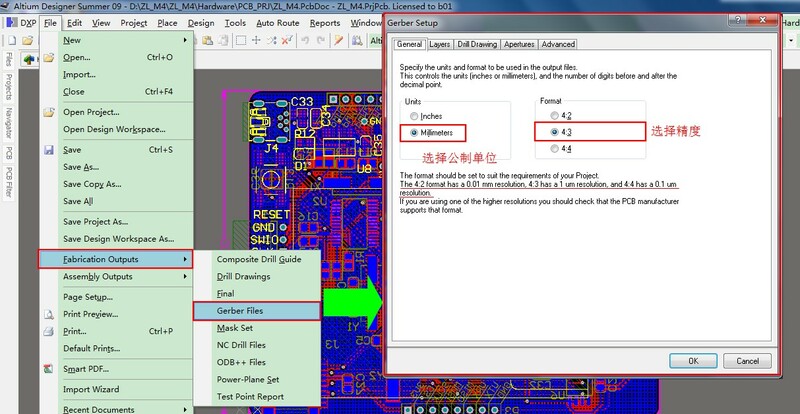 You will need a Gerber image file for each of the conductor layers, solder mask layers and legend layers. We suggest that even if the solder mask images are the same for both sides that you submit a file for each anyway. While we can accept these files in many formats the preferred format is 274-x with 4 digits after the decimal point (typically represented as 274-x 2.4). If your software does not have the capability to output the 274-x format you will need to use 274-d, this will require the image files as well as the aperture report (please generate one comprehensive aperture report that can be used for all files). If you have the option to set the position of the image on the film please set this to lower left corner. It is also preferred to have the board outline in the solder mask images and drill drawings only. We will view the files from the “Component” side looking down, through the printed circuit board. “Solder” side is ALWAYS on bottom. Including your part number and/or company name on copper layers (Right-Reading from the respective side of the board).And prevents your board from being build inverted (Top on Bottom, Bottom on Top). List all non-Gerber specs for this job, if not included in a fab. Print your contact information (include evening phone if you like).